The use of automated production equipment significantly reduces production and labour costs and minimises operator involvement, ensuring output consistency, quality and health & safety. After understanding your needs and thorough planning, each of these systems is developed from our best-in-class modular hardware and software base to a customer’s needs. The automation equipment is integrated as an entire system into your existing production equipment, or can be setup as an independent system. With in-house design, manufacture, assembly and testing to high quality standards we ensure that factory acceptance tests are carried out in a comprehensive manner prior to customer delivery. Ultraseal’s fully automated front load system increases productivity. Ultraseal’s fully automated robotic front load impregnation system. Programmable control on each module provides independent and consistent performance and quality. 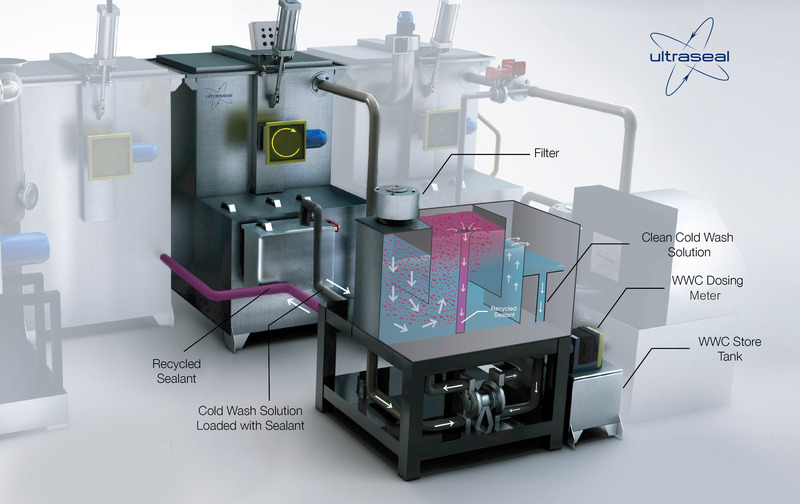 All impregnation systems can be specified with our market leading Ultraseal Recycling Technology and Recycling sealants providing best-in-class sustainability with greatly reduced sealant consumption, water consumption and effluent waste. Ultraseal’s best-in-class, modular front-loading impregnation systems offer greater speed, control and significant health and safety advantages to users, as well as the lowest cost of ownership. With manual loading and unloading, Ultraseal’s top loading impregnation systems deliver faster cycling times than competitor products.